What will happen in 12 months? My money's on Adversary Modes, and lots of them. Oh, and no invite-only. Amos Lancing and Jeremiah Shaw perhaps? Rockstar is wily, you know it, and I know it. But I hope, either way, good, bad, or indifferent, we get some new content soon because I is goin crazy playing the same story missions and showdowns over and over. I very much agree with @ALifeOfMisery about the nature of gameplay going forward. I really have zero interest in getting a farm, breeding horses, buying a gold prospecting plant, or even a moonshine distillery though that sounds like the most interesting of the bunch. Farming and gold mining, having a business and do ”MC sale”-type, dangerous and risky delivery missions for $500 each just makes me feel like sleeping. I really don’t think I’ll do that once more, the grind of GTAO was enough for me. 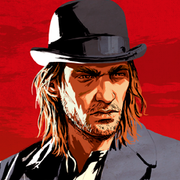 I want to hop online and try a daring train heist or take on a high paying but difficult bounty. Pull of a bank heist or intercept heavily guarded stage coaches carrying boxes of money from Valentine to St Denis, competing against other posses of players. My friend wants a farm and gold mining businesses. Zzz. BTDT. I feel like this is what most players want. A variety of ways to, first and foremost, have fun, but obviously make money, level up, roleplay etc. whilst having fun. A dynamic, interesting, surprising environment filled with choice and options. Not a stale, repetitive time sink. Properties and wagons are cool, but I just want to be able to do a damn cattle drive like the real wild west. It's in SP, so it shouldn't be hard to put in. Imagine trying to heard 10-20 head of cattle while jackasses shoot at you from all angles! Imagine trying to heard 10-20 head of cattle while jackasses shoot at you from all angles! I find current GTAO to be way less grindy than pre 2016 GTAO. At least with nightclubs, bunkers and biker businesses you can buy supplies and earn passively while you play missions, race or just waste time being a FR scrublord. I'd be happy if eventually we could own farms and ranches in RDO and have them act as passive income generators. Maybe have to do upkeep and defend it from enemies, and it could also act as a cover for illicit income like moonshining or stolen livestock. I think with Paint It Black III on Gatling / Maxim Turret, it may be possible to mark x on targets. But couldn't test it properly in Team Shootout. why not try it in the train mission? theres gattling guns on that train.